Clinton J. Hill was born in 1932. He attended Concordia College, Minnesota, where he studied history. After graduating in 1954 he joined the US Army. He left in 1957 and found work with the Chicago, Burlington & Quincy Railroad. Hill entered the Secret Service in September 1958. Hill did investigative and protection work in Denver until 1959 when he was assigned to the staff of the White House where he helped to protect Dwight Eisenhower and John F. Kennedy. In November 1963 Hill went on the presidential trip to Texas. His special duty was to protect Jackie Kennedy. On the motorcade tour of Dallas on 22nd November, 1963, Hill rode on the running board of the Secret Service car immediately behind the presidential car. 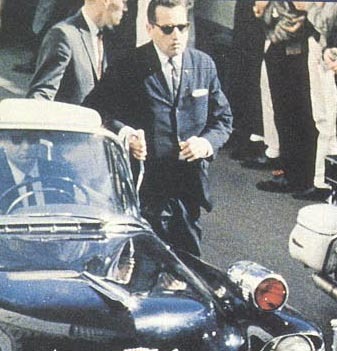 Hill was the only Agent to leave the follow-up car and attempt to protect those in the Presidential car. He rode spread-eagle over President and Mrs. Kennedy as the limousine raced to Dallas' Parkland Hospital. Hill was given an award from Mrs. Kennedy for "Extraordinary courage and heroic effort in the face of maximum danger." Hill remained assigned to Mrs. Kennedy and the children until after the 1964 presidential election. He then was assigned to President Johnson at the White House. Later, he became agent in charge of presidential protection in '67 when Johnson was still in office and when Nixon came in, he moved over to Vice President Agnew, SAIC job. Then they assigned Hill to headquarters where he became an assistant director for all protection. He retired in 1975. Agent Clint Hill rides on the rear step of the Limousine in Dallas. Mr. HILL. When we finally did reach Main Street, the crowds had built up to a point where they were surging into the street. We had motorcycles running adjacent to both the Presidential automobile and the followup car, as well as in front of the Presidential automobile, and because of the crowds in the street, the President's driver, Special Agent Greer, was running the car more to the left-hand side of the street more than he was to the right to keep the President as far away from the crowd aspossible, and because of this the motorcycles on the left-hand side could not get past the crowd and alongside the car, and they were forced to drop back. 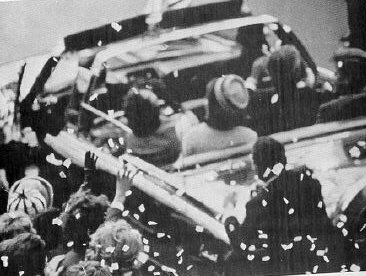 I jumped from the followup car, ran up and got on top of the rear portion of the Presidential automobile to be close to Mrs. Kennedy in the event that someone attempted to grab her from the crowd or throw something in the car." Mr. SPECTER. Did you have any other occasion en route from Love Field to downtown Dallas to leave the followup car and mount that portion of the President's car? Mr. SPECTER. 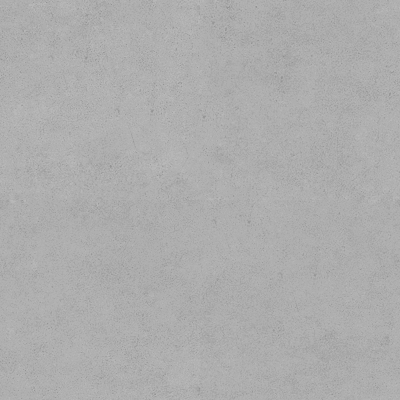 Did you have any occasion to notice the Texas School Book Depository Building as you proceeded in a generally northerly direction on Houston Street? Mr. HILL. Yes, sir. It was immediately in front of us and to our left. Mr. SPECTER. Did you notice anything unusual about it? Mr. HILL. Nothing more unusual than any other building along the way...We scan the buildings and look specifically for open windows, for people hanging out, and there had been, on almost every building along the way, people hanging out, windows open. Mr. SPECTER. And did you observe, as you recollect at this moment, any open windows in the Texas School Depository Building? Mr. HILL. Yes, sir; there were. Mr. SPECTER. Now, what is your best estimate of the speed of the President's automobile as it turned left off of Houston onto Elm Street? Mr. HILL. We were running still 12 to 15 miles per hour, but in the curve I believe we slowed down maybe to 10, maybe to 9...Well, as we came out of the curve, and began to straighten up, I was viewing the area which looked to be a park. There were people scattered throughout the entire park. And I heard a noise from my right rear, which to me seemed to be a firecracker. I immediately looked to my right and, in so doing, my eyes had to cross the Presidential limousine and I saw President Kennedy grab at himself and lurch forward and to the left... I jumped from the car, realizing that something was wrong, ran to the Presidential limousine. Just about as I reached it, there was another sound, which was different than the first sound. I think I described it in my statement as though someone was shooting a revolver into a hard object--it seemed to have some type of an echo. I put my right foot, I believe it was, on the left rear step of the automobile, and I had a hold of the handgrip with my hand, when the car lurched forward. I lost my footing and I had to run about three or four more steps before I could get back up in the car. Between the time I originally grabbed the handhold and until I was up on the car, Mrs. Kennedy--the second noise that I heard had removed a portion of the President's head, and he had slumped noticeably to his left. Mrs. Kennedy had jumped up from the seat and was, it appeared to me, reaching for something coming off the right rear bumper of the car, the right rear tail, when she noticed that I was trying to climb on the car. She turned toward me and I grabbed her and put her back in the back seat, crawled up on top of the back seat and lay there...We were running between 12 to 15 miles per hour, but no faster than 15 miles per hour. Mr. SPECTER. How many shots have you described that you heard? Mr. SPECTER. Did you hear any more than two shots? Mr. HILL. No, sir...at the time that I jumped on the car, the car had surged forward. The President at that time had been shot in the head. Mr. SPECTER. Would you tell us with more particularity in what way he grabbed at himself? Mr. HILL. He grabbed in this general area. Zapruder frame #246 showing the president reacting to his throat shot. Mr. SPECTER. You are indicating that your right hand is coming up to your--to the throat? Mr. SPECTER. And the left hand crosses right under the right hand. Mr. HILL. To the chest area. Mr. SPECTER. To the chest area. Was there any movement of the President's head or shoulders immediately after the first shot, that you recollect? Mr. HILL. Yes, sir. Immediately when I saw him, he was like this, and going left and forward. Mr. SPECTER. Indicating a little fall to the left front. Mr. SPECTER. Now, what is your best estimate on the timespan between the first firecracker-type noise you heard and the second shot which you have described? Mr. HILL. Approximately 5 seconds. Representative FORD. It was 5 seconds from the firecracker noise that you think you got to the automobile? Mr. HILL. Until I reached the handhold, had placed my foot on the left rear step. 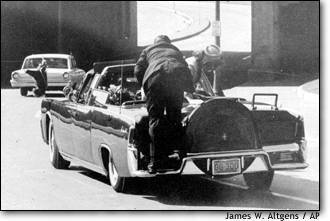 Mrs. Kennedy is reaching to the rear as Agent Hill jumps on the rear of Limo. Mr. HILL. I thought I saw something come off the back, too, but I cannot say that there was. I do know that the next day we found the portion of the President's head. Mr. SPECTER. Where did you find that portion of the President's head? Agent Hill on the limousine as it speeds down the highway. I remained with Mrs. Kennedy except for one time when I was requested to come to the morgue [at Bethesda] to view the President's body...I saw an opening in the back, about 6 inches below the neckline to the right-hand side of the spinal column. Mr. SPECTER. And did you have a reaction or impression as to the source of point of origin of the second shot that you described? Mr. HILL. It was right, but I cannot say for sure that it was rear, because when I mounted the car it was--it had a different sound, first of all, than the first sound that I heard. The second one had almost a double sound--as though you were standing against something metal and firing into it, and you hear both the sound of a gun going off and the sound of the cartridge hitting the metal place, which could have been caused probably by the hard surface of the head. But I am not sure that that is what caused it. Mr. SPECTER. Now, do you now or have you ever had the impression or reaction that there was a shot which originated from the front of the Presidential car? Clinton J. Hill, Statement, November 30, 1963. President and Mrs. Kennedy entered the automobile with the President getting into the right rear seat and Mrs. Kennedy into the left rear seat. Mrs. Connally got into the left jump seat and Governor Connally into the right jump seat. SA William Greer was driving the automobile with ASAIC Roy H. Kellerman in the right front seat. I went to the left rear side of the Presidential automobile and stood on the airport ramp along side where Mrs. Kennedy was sitting. As the Presidential automobile began to move forward at 11:55 a.m. I walked along side of the left rear of the automobile for about 150 feet, and since there were no people at all on the airport ramp I went back to the automobile immediately behind the Presidential Automobile and mounted the forward portion of the left running board. SA Sam Kinney was driving this Secret Service Follow-up car which was a 1955 Cadillac 9-passenger convertible specifically outfitted for use by the Secret Service. ATSAIC Emory Roberts was sitting in the right front seat and operating the two way radio. SA John Ready was on the forward portion of the right hand running board; SA William McIntyre on the rear portion of the left hand running board; SA Paul E. Landis on the rear portion of the right hand running board; Mr. Kenneth O'Donnell, Presidential Appointment Secretary, was seated on the left side of the second seat; Mr. Dave Powers, Presidential Receptionist, was seated on the right side of the second seat; SA George Hickey was seated on the left side of the third seat- and SA Glen Bennett was seated on the right side of the third seat.The Presidential Follow-up car was followed by a 1964 Lincoln 4-door convertible occupied by Vice-President and Mrs. Lyndon Johnson, Senator Ralph Yarborough, with ASAIC Rufus Youngblood in the right front seat. This automobile was followed by a Secret Service follow-up car for the Vice President, and then came automobiles occupied by photographers, correspondents, Senators and Congressmen. Preceding the Presidential automobile was a Dallas Police Department Lead car in which SA Winston Lawson of the Secret Service was riding. Police motorcycles preceded and flanked the motorcade. There were two police motorcycles on the left side of the President's Secret Service follow-up car running abreast of one another between the automobile and the crowd of people. My instructions for Dallas were to work the left rear of the Presidential automobile and remain in close proximity to Mrs. John F. Kennedy at all times. The agent assigned to work the left rear of the Presidential automobile rides on the forward portion of the left hand running board of the Secret Service follow-up car and only moves forward to walk alongside the Presidential automobile when it slows to such a pace that people can readily approach the auto on foot. If the crowd is very heavy, but the automobile is running at a rather rapid speed, the agent rides on the left rear of the Presidential automobile on a step specifically designed for that purpose. As the motorcade moved from Love Field through downtown Dallas toward the Trade Mart, there were four (4) occasions before we reached the end of Main Street where I moved from the forward portion of the left running board of the follow-up car to the rear step of the Presidential automobile. I did this because the motorcycles that were along the left hand side of the follow-up car were unable to move up alongside the President's car due to the crowd surging into the street. The motorcycles were forced to drop back and so I jumped from the Follow-up car and mounted the President's car. I remained in this position until the crowd thinned and was away from the President's automobile, allowing the motorcycles to once again move up alongside of the automobile. When we approached the end of Main Street the crowd was noticeably less dense than had been the case prior to that point. The motorcade made a right hand turn onto Elm Street. I was on the forward portion of the left running board of the follow-up car. The motorcade made a left hand turn from Elm Street toward an underpass. We were traveling about 12 to 15 miles per hour. On the left hand side was a grass area with a few people scattered along it observing the motorcade passing, and I was visually scanning these people when I heard a noise similar to a firecracker. The sound came from my right rear and I immediately moved my head in that direction. In so doing, my eyes had to cross the Presidential automobile and I saw the President hunch forward and then slump to his left. I jumped from the Follow-up car and ran toward the Presidential automobile. I heard a second firecracker type noise but it had a different sound-- like the sound of shooting a revolver into something hard. I saw the President slump more toward his left. I jumped onto the left rear step of the Presidential automobile. Mrs. Kennedy shouted, "They've shot his head off," then turned and raised out of her seat as if she were reaching to her right rear toward the back of the car for something that had blown out. I forced her back into her seat and placed my body above President and Mrs. Kennedy. SA Greer had, as I jumped onto the Presidential automobile, accelerated the Presidential automobile forward. I heard ASAIC Kellerman call SA Lawson on the two-way radio and say, "To the nearest hospital, quick." I shouted as loud as I could at the Lead car, "To the hospital, to the hospital." As I lay over the top of the back seat I noticed a portion of the President's head on the right rear side was missing and he was bleeding profusely. Part of his brain was gone. I saw a part of his skull with hair on it lying in the seat. The time of the shooting was approximately 12:30 p.m., Dallas time. I looked forward to the jump seats and noticed Governor Connally's chest was covered with blood and he was slumped to his left and partially covered up by his wife. I had not realized until this point that the Governor had been shot. When we arrived at Parkland Memorial Hospital, Dallas, I jumped off the Presidential automobile, removed my suit coat and covered the President's head and upper chest with it. I assisted in lifting the President from the rear seat of the automobile onto a wheel type stretcher and accompanied the President and Mrs. Kennedy into the Emergency Room. Governor Connally had been placed in an Emergency Room across the hall.